Practice the Principles of the Twelve Traditions in O A meetings and everyday life with this new wallet card. Practice the Principles of the Twelve Traditions in O A meetings and everyday life with this new wallet card. 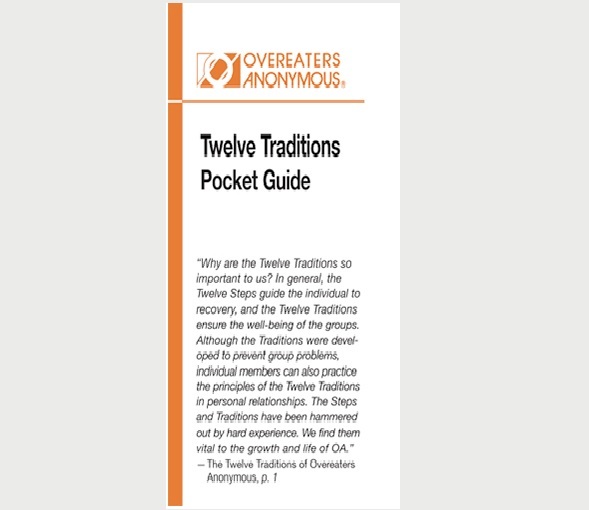 The Twelve Traditions Pocket Guide includes examples of how to apply the Traditions and can be used individually or as the focus of a group or workshop. With more than thirty tips, this pocket guide has great suggestions of what to say and what not to say when speaking to someone about Overeaters Anonymous for the first time. When the compulsive urge strikes, instead of food, turn to this pocket-sized reminder for a quick and potent list of OA’s alternatives.